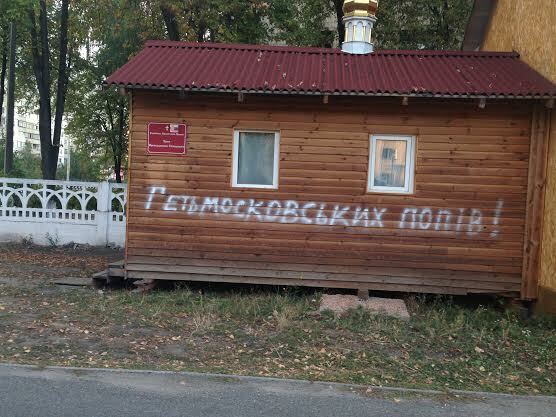 Moscow, October 2, Interfax - Act of vandalism was committed against the Transfiguration Church in Kiev. Malefactors left insulting inscriptions on the wall of the building located near a T.B. prophylactic center, they wrote: “Moscow priests go away,” press service of the Ukrainian Orthodox Church reports on Friday. “It is not the first case of insulting Orthodox churches in Kiev. Earlier it was reported about a number of attempts committed by radical groups, hostile to the Ukrainian Orthodox Church, to set on fire the Church of the Icon of Joy of All who Sorrow in the Babi Yar,” the message reads.